Pualei Circle is one of the more affordable places to live at Diamond Head, an upscale and expensive neighborhood. 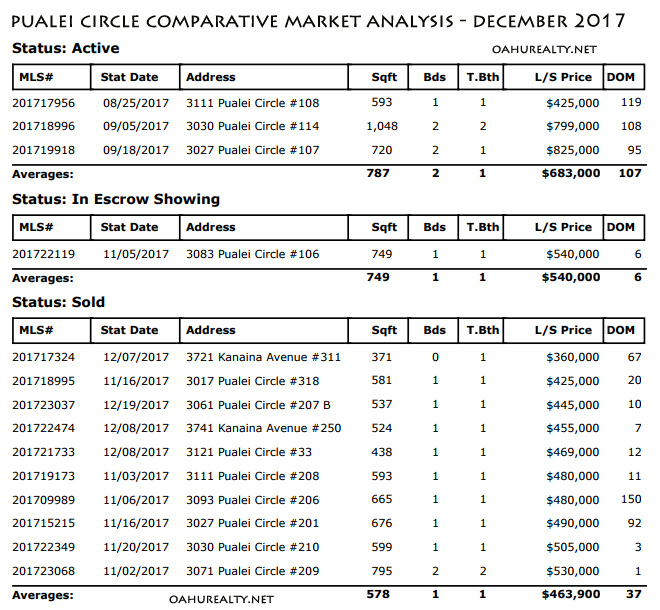 Here's a comparative market analysis of Active listings, in escrow and recently sold (November to late-December, 2017). Leahi Avenue is the main access way to Pualei Circle and Diamond Head Surf is located there. Off Monsarrat Avenue, Kanaina Avenue is an alternate route to Diamond Head Sands as well as Ilima Apartments, Diamond Head Manor Apartments and Diamond Head Lanai. I mention this because while some of the buildings don't have Pualei Circle addresses, locals generally consider them part of the neighborhood. And some buildings with Pualei Circle addresses are accessible via Kanaina Avenue. Here's the market wrap-up for the end (or almost the end, less one week) at Pualei Circle! Three active listings (active = available for sale now) priced between $425,000 and $825,000. That is a very low inventory and it shows how popular this neighborhood can be, more so considering the price of new condos in Kaka'ako. Note - all of the condos at Pualei Circle were built in the 1950's, 60's and 70's. There are no "new construction" condos here. One listing is in escrow listed at $540,000 (the actual contract price may vary) and 10 condos sold in November and December. The lowest priced sold listing was $360,000 for a studio at Head Sands, a nice clean unit with covered parking. The highest priced recently sold was a two bedroom at Pua Leahi Apartments for $530,000. For people looking at Pualei Circle and in need of an elevator, Pua Leahi Apartments is THE building (as in, the only building) with an elevator. Of the two Active listings currently for sale, 3030 Pualei Circle #114 is a larger two bedroom, two bath unit at Diamond Head Leilani - that's the building right in the center of Pualei Circle. As of today it's been on the market 108 days and the price is $799,000, reduced from the original list price of $918,500. Diamond Head Leilani has the most spacious condos at Pualei Circle. Diamond Head Alii #107 priced at $825,000 is a ground floor two bedroom condo with 720 square feet interior area and a 630 square foot lanai, making for a large open-air Diamond Head residence. The market is "hot" and growth has been steady - unlike 2003-2005 when Oahu home prices "took off" and people were talking about real estate bubbles. It looks like 2018 will be a good year with consistent sales growth. Feel free to contact me about buying and selling at Pualei Circle!